SQL Server exposes multiple trace flags which are required to set specific server characteristics or to switch off a particular behavior. Some trace flags are required to enable the fix post the installation of the update. This is currently a work-in-progress. The trace flags mentioned in the table below have the associated public article links mentioned which provide more information about the trace flag. If you want a trace flag to be mentioned in the list below, then feel free to leave a comment. Note that only publicly documented trace flags will appear in this list. The list of trace flags available for SQL Server 2005 are documented here. 1. Data mentioned below is as of 17th July, 2012. 2. Trace flags should be used under the guidance of Microsoft SQL Server support. They are used in this post for discussion purposes only and may not be supported in future versions. 3. Trace flags for hotfixes should be only enabled if the fix is applicable to the SQL Server instance that you are enabling the trace flag on. This is the last post for the System Health Session series. In this post, I shall show you how to extract deadlock related information from the deadlock graph captured by the System Health Session. The query below will provide you with the time stamp when the deadlock was reported along with victim process identifier. The script file for the above queries can be downloaded from here. The second dataset which shows the parsed process list from the deadlock graph is for the timestamp highlighted above. As mentioned in one of my previous posts, the custom reports used in the previous posts can be downloaded from here (Filename: System_Health_Session_Custom_Reports.zip). Modification April 20th, 2012: Just updated the .sql files and added the Deadlock Report to the SkyDrive location. If you don’t have the updates installed, then Jonathan (Blog | Twitter) has shown in his article Retrieving Deadlock Graphs with SQL Server 2008 Extended Events how to workaround the issue. Michael Zilberstein’s (Blog) article, Parsing Extended Events xml_deadlock_report, has an updated/corrected version of the T-SQL to fetch the deadlock information. 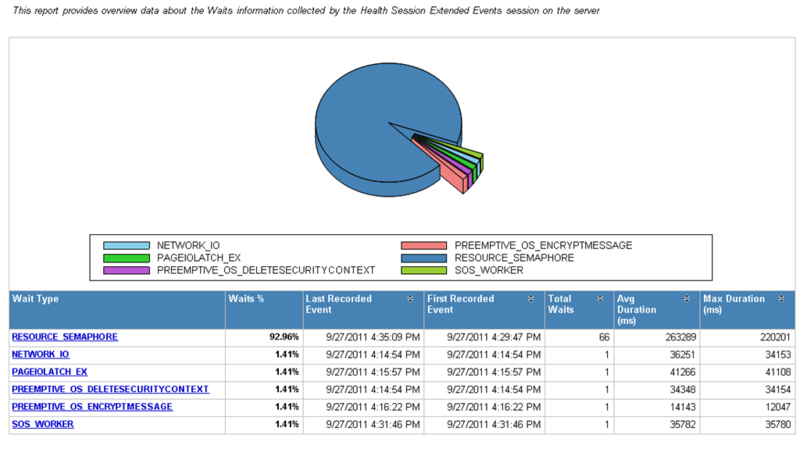 In my last post, I had demonstrated how to fetch the waits information captured by the System Health session. 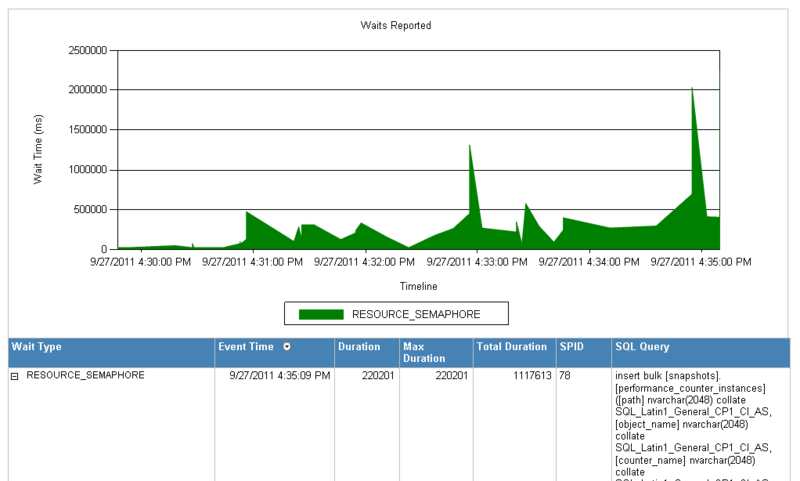 In this post, I shall show the custom reports that can be built using the waits information fetched. The above report gives a summary of all the waits recorded by the health session. I have a second level drill-down available which allows me to get specific information for each of the distinct waits reported above and lets me get the SQL Query that experienced the wait. As you can see above, that I have the SQL query, the time when the wait was reported along with duration statistics of the wait. Another category of events that are tracked by the System Health session are non-yielding scheduler conditions (reported using the error number 17883) in SQL Server. So if your SQL Server instance encountered a non-yielding scheduler condition, then this information can be tracked using System Health session. The query below will give you the information of all the non-yielding conditions detected by the SQL Server instance subject to condition that the ring buffer storing this information has not been overwritten. The .sql file for the above script is available here. A sample output of the above query is shown on the left. An important information in this output is the worker address. Using this worker address, I can get the relevant messages pertaining to the non-yielding condition. 2011-09-27 21:57:51.560 Server Process 0:0:0 (0x18c0) Worker 0x000000000606A1A0 appears to be non-yielding on Scheduler 5. Thread creation time: 12961597452926. Approx Thread CPU Used: kernel 0 ms, user 0 ms. Process Utilization 0%. System Idle 98%. Interval: 70077 ms.
2011-09-27 21:58:51.660 Server Process 0:0:0 (0x18c0) Worker 0x000000000606A1A0 appears to be non-yielding on Scheduler 5. Thread creation time: 12961597452926. Approx Thread CPU Used: kernel 0 ms, user 0 ms. Process Utilization 0%. System Idle 97%. Interval: 133017 ms.
2011-09-27 21:59:51.760 Server Process 0:0:0 (0x18c0) Worker 0x000000000606A1A0 appears to be non-yielding on Scheduler 5. Thread creation time: 12961597452926. Approx Thread CPU Used: kernel 0 ms, user 0 ms. Process Utilization 2%. System Idle 94%. Interval: 193116 ms.
2011-09-27 22:00:51.860 Server Process 0:0:0 (0x18c0) Worker 0x000000000606A1A0 appears to be non-yielding on Scheduler 5. Thread creation time: 12961597452926. Approx Thread CPU Used: kernel 0 ms, user 0 ms. Process Utilization 3%. System Idle 93%. Interval: 253215 ms. If you look at the Errorlog snippet above, you will notice that there are entries for the highlighted worker address are same as the one reported in the management studio output screen shot above. The time reported in the Errorlog is the server time (in my case it is UTC+5:30) where as the time stamps reported by the health session is UTC time which means that the timestamps reported also match. Using the events from the System Health Session and the Errorlog entries, I will be able to figure out when a non-yielding condition occurred on the server instance. In the last post for this series, I shall provide the set of queries that can be used to parse a deadlock graph collected by the System Health session along with the .rdl files for the custom reports used in this series.